New SNK ARCADE MVS Magic Key released! 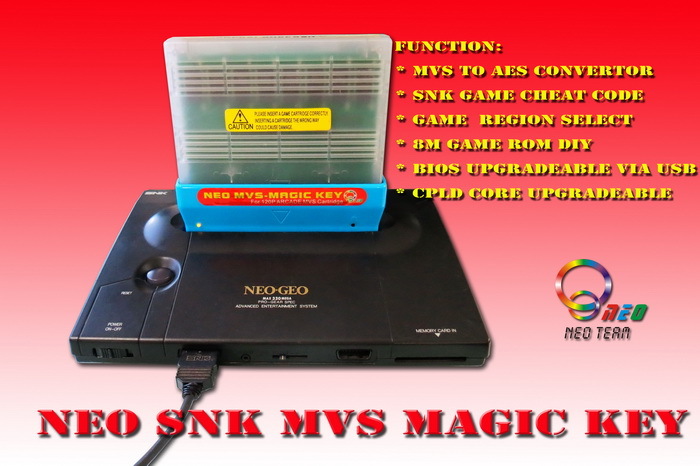 Here is neo team new product: SNK MVS Magic Key + MVS convertor 2in1 ! How to use? Very simple, just need insert the MVS cart to the NEO MVS Magic Key, then plug into the SNK console,power on, that's all. When power on the neogeo console, it will show one menu to let you select which game region you want with this game , use A/B/C button to select it. Note: If you press this button and turn on NEOGEO console, it'll bypass the Magic Key function and run as a normal original SNK cartridge. If you don't do anything it will auto pass after few seconds and use the default game region to start the game. In the game , you can press "SELECT"+"START" buttons together to call the cheat code menu out in any time. Use button "A" to enable which cheat code you want to active, use "UP" and "DOWN" pad to move, and press button "C" to return to game and play continue. If you want to disable the current cheat code function, press "SELECT"+"START" in any time, then you can back to cheat code menu again. Use button "A" to disable the cheat code, or use button "B" to disable all cheat code at once. Now the game back to the normal mode. This device support all MVS original games, here is some more screenshots. 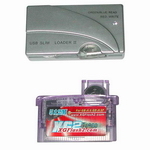 Firstly you need install the "The SMS4 & MD & N64 & SNES & PC-E Myth flash cart_ Pro programmer V1.30 [Jan.15 2012] .exe" , if you have installed it already just pass this step. Neo-SNK-MagicKey_8Mb.xml and 2 BIN files. Copy these 2 BIN files to the "D:\" folder , and copy "Neo-SNK-MagicKey_8Mb.xml" this file to "C:\Program Files (x86)\NEO2\Manager\Kernal_Kit\BATCH" this folder IF your system is WIN7 ; otherwise copy it to "C:\Program Files\NEO2\Manager\Kernal_Kit\BATCH" . Now you can see this app screen. Use the USB cable to link the SNK Magic-Key and PC USB port,please ignore the error message. Press the "Start To Burn" button, then start to upgrade MagicKey bios, please note the LED of MagicKey will not light during the whole BIOS upgrade process. It will start to verify after the burning complete. When it done, you can plug it into your console to enjoy the MagicKey with new BIOS function. Notes: "Wang Jung Wang" is the Korean name, and incidently one of the best names evah. Note: The new 2016 version is GREEN plastic case.